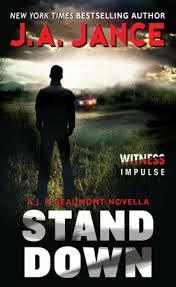 Blurb: Life has shifted for J. P. Beaumont. After a tragic accident that devastated—and ultimately disbanded—his Special Homicide Investigation Team, he accepts that he has left homicide detection behind at this point, but he has a lot of unanticipated free time on his hands. He’s keeping busy with renovations on the new house that he and his wife Mel Soames, the newly appointed Chief of Police in Bellingham, Washington, have bought. But new fixtures and paint palettes can occupy only so much of Beau’s daily life, and Mel is encouraging him to return to where he is needed: investigating crimes. In the meantime, she is struggling to gain control of her new situation, cast into a department where some are welcoming—and some are not. It’s been a few months, and the tension in the police department is rising, but Beau realizes Mel has to tackle things in her own way, so he refrains from advising. But when Beau shows up one afternoon to survey the construction at their new house and finds Mel’s car there but no sign of her, his investigative instincts kick in. Suddenly he’s back in the game—except this time, his heart is on the line as well as his professional dignity. Review: I was contacted about this novella a while ago and had kind of filed it away thinking it sounded interesting, but I wasn’t really sold on it. But when I got a second email reminding me about it because the release date was near, I thought I’d give it a try. What’s to lose when there’s only112 pages? Part of my reluctance is that I’ve actually only read one book in the J.P. Beaumont series and it was many, many years ago. So I figured I would be completely lost jumping into this series at book 21.5! But fear not … I had no trouble sliding right in with Beau and Mel. There was just enough background that I wasn’t scratching my head trying to figure out who was who and what was going on. Actually it made me want to read some of the previous books to really know more of the backstory (BAD Tara! The last thing you need is another book series……). I was a little more than bummed when I reached the end of this novella. I was definitely left wanting more. I found this slim installment to be a lot of fun. It was fast paced and entertaining. I’m glad I gave this one a shot; I would definitely recommend it. I haven’t read Jance in a long time either. This sounds like a perfect book to get reacquainted. Thanks for sharing.